Our first thoughts of Mercury, known as Hermes to the Greeks, are often as the bright and quicksilver fleet-footed youthful messenger of the Greco-Roman pantheon who is often reduced to the operation of our rational intellect in astrological symbolism. 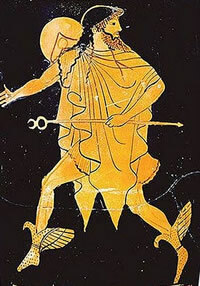 Yet, Hermes was also psychopomp, guide of souls in the dark shady Underworld and venerated as Trismegistus (three times great) in Hellenistic Egypt where he was credited as the fountainhead of the Hermetic arts of astrology, alchemy and magic. I explore the myth and astrology of this enigmatic planetary god in my recording of Hermes – Guardian of Thresholds, our featured Audio Program this month. Saturn is connected to the Greek god Kronos whose name is similar to the word for time. This God of Time was defeated in a battle for supremacy by his son Zeus, symbolizing how the old must give way to the new. He was then chained and imprisoned in the underworld Tartarus. Subsequently Saturn’s cult spread to Rome where he became the patron deity of agriculture and along with his wife Ops, which means bounty, presided over a golden age of happiness and plenty harvested from the fruits of the earth. Here in the northern hemisphere we are now moving toward the dark days of winter that invite us to draw into the deep quiet within. I recently returned from a trip to Spain, where I had the opportunity to research the life of the mystic Saint Teresa in her home town of Avila. I will be presenting this research in a new talk entitled The Sacred Marriage: Vesta, Juno and Psyche on November 2-4 at the Evolutionary Astrology Conference in Portland Oregon. There was a powerful response to the Dark Goddess asteroid readings I offered this summer, profound and moving for many people. To go deeper into how the mysteries of the lunar cycle – her dark phases and archetypes – help to place your entire life in context, I invite you to join me in the highlands of Mexico for a Dark Moon Goddess Retreat April 6-10, 2013. We’ve now arrived at the halfway point between Summer Solstice and Fall Equinox. While we are still in the midst of summer, our thoughts are beginning to stretch ahead into what the fall season has in wait for us. And speaking of the fall season, mark the weekend of November 2-4, 2012 for the Jeffrey Wolf Green Evolutionary Astrology Conference, where I will present again this year. The conference was very successful last year, and will take place again at the Still Mountain Conference and Retreat Center near Portland, Oregon. The early registration price is available until August 15th. I’ll present an asteroid lecture on The Sacred Marriage: Vesta, Juno, and Psyche. This talk will be a modern update of material I presented a few UAC's back, in a talk titled Venus, Vest and Juno. Yesterday, as part of my post-birthday celebration, I went on a rafting trip along the scenic and wild rapids of the nearby McKenzie River. While on that adventure, I was inspired as to how to write this newsletter. It is all about the guide on the journey. This was my first river rafting experience of this level, and I was happy indeed to hear that our seasoned guide has been navigating these waters for 35 years. Let’s take a look at which planetary archetype is guiding the journey for our two presidential candidates, Barack Obama and Mitt Romney. Here in the Northern hemisphere, the Sun has reached its maximum ascent, and with the longest hours of daylight illuminating our conscious mind, many of us have likewise reached the greatest extension of ideas associated with our Gemini house. The recent transit of Venus and the solar/lunar eclipses in this sign have intensified much seeding and fertilizing activity in our mind-streams. Now as the Sun pauses and changes directions, it is time to narrow the many possibilities and focus on those we want to nurture as the Sun now shines its light upon our Cancerian urges. Greetings to you on this May Day, which the ancient Romans celebrated in honor of Flora, the goddess of flowers. During this season when the blaze of wildflowers covers the earth in dazzling arrays of color, Jupiter has been culminating over my Midheaven. I’ve had the great good fortune to travel to many places teaching astrology and will share some of the highlights from these visits. But first, a few words about the upcoming Venus ‘transit’ or occultation which occurs on June 5 as Venus can been seen moving across the face of the Sun along its outer rim. This is a rare celestial event, which takes place only about once each century and comes in pairs that are 8 years apart. The astronomy is similar to that of an eclipse of the Moon. The orbital plane of Venus is tilted at a slight angle to that of the ecliptic – the Sun’s apparent path as seen from earth. The two points at which these planes intersect are designated as the nodes of Venus – the point at which the path of Venus orbit crosses the ecliptic from south to north motion is the North Node at 16 Gemini and where it crosses as it travels from north to south is the South Node at 16 Sagittarius. The degrees of these heliocentric nodes remain almost constant over millennia. When there is a conjunction of Venus and Sun and it occurs on the degree of one of these nodes as it will on June 5 when the Sun, Venus, Venus North Node are all at 16 Gemini, we have an occultation or eclipse of the Sun by Venus as she is seen to pass over him. Each time I visit Greece, she reveals yet another layer of her beauty and indomitable spirit. This October, we were fortunate to be there at a historical moment, able to witness and take part in the passionate nationwide strikes and protests by the Greek people against the austerity measures being imposed upon them by foreign interests. The fountainhead of Western participatory democracy still flows forth with vibrant life force. My travels began on October 1 with a week in northern Greece before I met up with the tour. Mary Lou Miller and Kate Petty joined me in an idyllic retreat on the remote island of Samothrake that houses a pristine and untrammeled site of the ancient pre-Hellenic Sanctuary to the Great Gods and where Alexander the Great was conceived during the nocturnal mystery initiations. While exploring the expansive grounds shrouded in a timeless eternity, we met a conservator of the archaeological remains. She invited us to her home for a meditation with a number of spiritually minded residents of the island, and we wished we could stay there forever.